Reward and Promote Time on Task, never reward time “off-task”. Students with ADHD have difficulty sustaining focus to the completion of a task, unless it is really interesting. One of the problems with ADHD is a “Working Memory” deficit. It is a neurological problem that is characterized by several things, but the two most important to this section are (1) difficulty with the “sense” of time, not “sensing” how long they have been working on a project or how long something will take to complete; and (2) staying focused until a task is actually completed. ADHD students often “live in the now.” So the idea of working on something that is not due until sometime in the future is not very motivating for them, and they will need help getting large projects completed on time. Students with ADHD will often be at work on one project, when they are distracted by another. Rarely will they return to the first project and work on it until completed. You must help them with this. One of the hallmarks of attentional problems is the difficulty with sustaining attention on tasks over time. 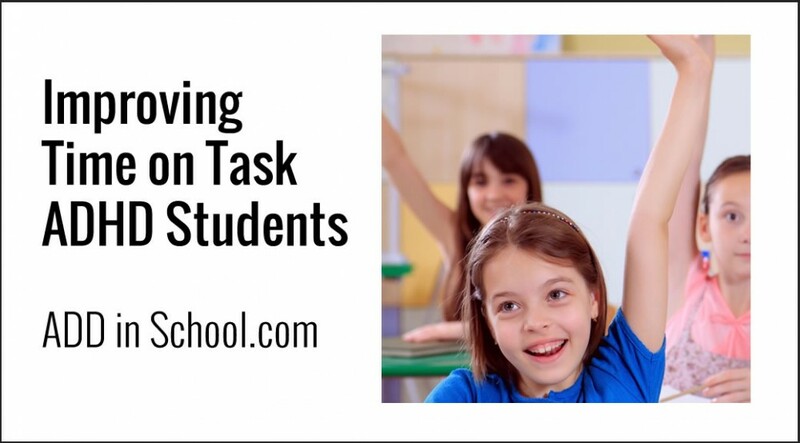 Students with attentional problems may need different levels of external/internal stimulation to enhance task focus. Promote time on task, never time off task. Give a minute timer to keep on his desk. Ask the child how long he thinks it would take to perform a certain task. Let him set his own time and race against the timer. Along with breaking up the need for sustaining attention for a long period, your student would do better when allowed frequent breaks to move around inside and outside the classroom. This may vary from a daily outside walk, doing errands around the building, to classroom stretching exercises. Your student tends to lose focus and his activity level may increase during the day. Therefore, schedule the most demanding attentional tasks in the morning. Your student may get overwhelmed with large assignments. His attention may wander after guided practice on similar tasks. Adjust the assignment down to smaller intervals. Give the assignment one sheet at a time. Assign every third problem, rather than every one, for completion to reflect mastery level. Cut apart single worksheets into strips. Tailor guided practice to occur during those time periods. Schedule breaks after this optimum attention time period and then return to the assignment. Seat work is often extremely difficult. This can become compounded when the teacher is instructing another small group. Check on your student as much as possible or have him check in with the teacher. Consider using a point system. Since a characteristic of students with an attentional problem is the seeking of highly stimulating materials, computer assisted instruction and drill can be highly successful and may also enhance keyboarding skills as well as fine motor coordination. ADHD Students will often get more work done if they have a “buddy.” Just having someone else around often helps the student to stay focused a bit longer.